Who were the Crusaders? What age were they? Did women travel to the crusades? And what prompted people to undertake the incredibly arduous journey from Europe to the Middle East? What could possess tens of thousands of people to travel to a country over 1000 miles away when most people in the Middle Ages never left their villages? The first crusade was called the 'People's Crusade'. Men, women and children were so motivated by the preachings of men like Peter the Hermit and Walter the Penniless that they left their homes and followed the call to the crusades. The crusaders, consisting of ordinary people, who followed Peter the Hermit eventually numbered over 15,000. Other massive numbers of crusaders followed men like Walter the Penniless and the numbers increased to 80,000. The Knights and armies did not accompany these people - the military expeditions took far longer to organise. The estimated forces of the First Crusade numbered 4,500 cavalry and 30,000 foot soldiers. 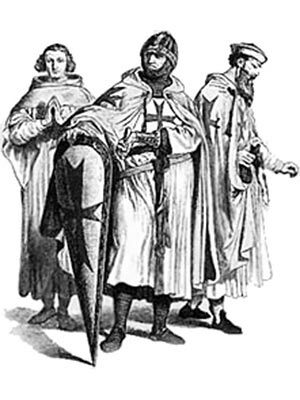 The Crusaders of the First Crusade travelled overland to Jerusalem. Western Europe rang with the cry, "He who will not take up his cross and follow me, is not worthy of me." The contagion of enthusiasm seized all classes; for while the religious feelings of the age had been specially appealed to, all the various sentiments of ambition, chivalry, love of license, had also been skilfully enlisted on the side of the undertaking. The crusades were not simply an expression of the simple faith of the Middle Ages. Something more than religious enthusiasm sent an unending procession of crusaders along the highways of Europe and over the trackless wastes of Asia Minor to Jerusalem. The crusades, in fact, appealed strongly to the warlike instincts of the feudal nobles. They saw in an expedition against the East an unequalled opportunity for acquiring fame, riches, lands, and power. The Normans were especially stirred by the prospect of adventure and plunder which the crusading movement opened up. By the end of the eleventh century they had established themselves in southern Italy and Sicily, from which they now looked across the Mediterranean for further lands to conquer. The crusades also attracted the lower classes. So great was the misery of the common people in medieval Europe that for them it seemed not a hardship, but rather a relief, to leave their homes in order to better themselves abroad. Famine and pestilence, poverty and oppression, drove them to emigrate hopefully to the golden East. The Church, in order to foster the crusades, therefore promised both religious and secular benefits to those who took part in them. A warrior of the Cross was to enjoy forgiveness of all his past sins. If he died fighting for the faith, he was assured of an immediate entrance to the joys of Paradise. The Church also freed him from paying interest on his debts and threatened with excommunication anyone who molested his wife, his children, or his property. Before the regular armies of the crusaders were ready to move, those who had gathered about Peter the Hermit, becoming impatient of delay, urged him to place himself at their head and lead them at once to the Holy Land - the People's Crusade. Dividing command of the mixed multitudes with a poor knight, called Walter the Penniless, and followed by a throng of about 80,000 persons, among whom were many women and children, the Hermit set out for Constantinople by the overland route through Germany and Hungary. Thousands of the crusaders fell in battle with the natives of the countries through which they marched, and thousands more perished miserably of hunger and exposure. Those that crossed the Bosporus were surprised by the Turks, and almost all were slaughtered. Each section of this Middle Ages website addresses all topics and provides interesting facts and information about these great people and events in bygone Medieval times including Crusaders . The Sitemap provides full details of all of the information and facts provided about the fascinating subject of the Middle Ages!